The Start Page is the launchpad of your browser and will appear anytime you open a new tab in Vivaldi. 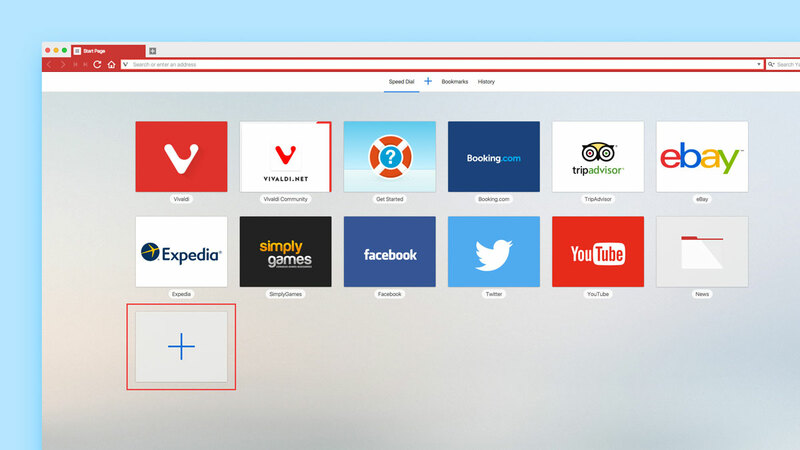 It gives you instant access to your favourite links, browsing History and Bookmarks manager. There are a number of ways to customize the look and behaviour of the Start Page to get things feeling just right. After all, this is your browser. Speed Dials are links shown as thumbnails in the main area of the page. Adding a new link to your Speed Dial is as easy as clicking the big ‘+’ button. Once clicked, a dialog will appear in the bottom of the screen where you can enter the link to be added. Click ‘Save’ and a new thumbnail will appear on the page immediately. To remove a link, hover over the thumbnail until a close button (‘x‘) appears. Click the ‘x’ to delete the link. Want to start with a clean slate? Click the ‘+’ sign at the top of the page to create a new Speed Dial folder. When you first fire up Vivaldi you’ll see how easy it is to change the background image of your Start Page. We’ve built-in a handful of stock ones to get you started. You’ll find the option to upload a custom background image in Settings → Start Page. Of course, the thumbnails used on your Speed Dial links can be customized too. 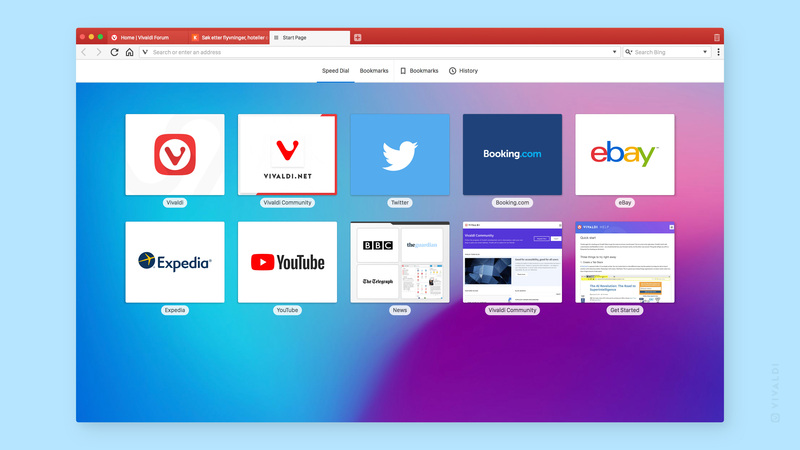 When you add a new link to your Speed Dial, Vivaldi will fetch a preview image of the site and use that as the thumbnail on your Start Page. To use a custom image as a Speed Dial thumbnail simply hover the existing thumbnail, click the ‘+’ sign that appears and select an image from your computer. You can also use custom thumbnails for sub folders in your Speed Dial. JPG, PNG and GIF (animations anyone?) all work. For the best results use an image with dimensions of 440×360. 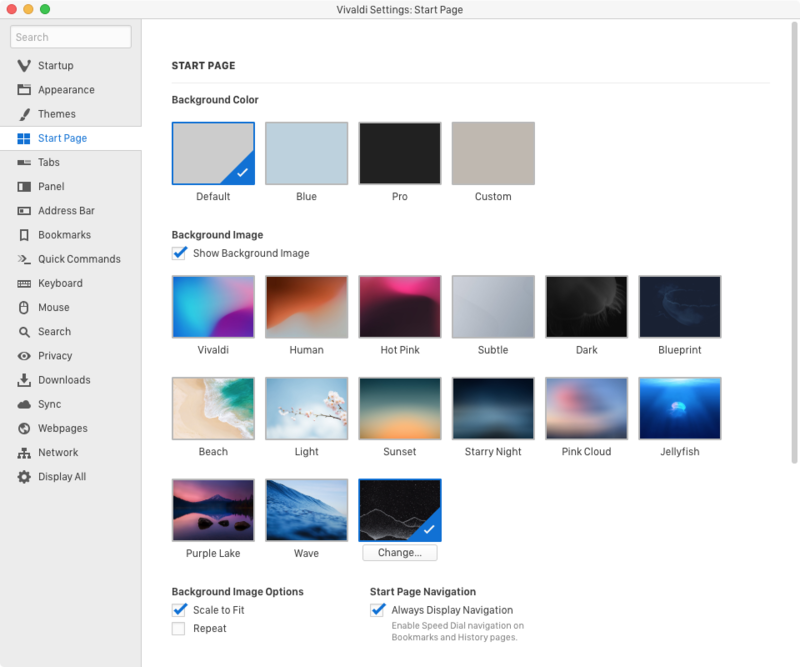 Together with your Theme settings, custom background images and Speed Dial thumbnails let you create a Start Page that’s all your own. Give it a shot! We love to see what people come up with – share a snap of your creation with us on Twitter. Visit the Speed Dial Help Article for even more ways to customize your Start Page.